A few weeks ago, I was watching TV, and they featured this quaint shopping center in Malibu --- The Malibu Lumberyard. From that time on, I've been waiting for the right weekend to take a drive out there. Today was that perfect weekend. Only in Malibu will you find this. I've lived in L.A. for 20 years and this is the first time I've seen this. Malibu is home to movie stars and other famous people. As much as we want to photograph their every move, they are people too. Nuff said. The place is not that big. It is actually comfortably intimate, with only a few high end shops and a few eats. It has two levels, and notice the wood all around. The entire flooring of this exterior courtyard is made of wood deck, and the fascia above is also made of wood. Notice that the fascia is curved, which also means that the wood had to be bent to achieve this architecture. This is a very appropriate use of material because afterall, The Malibu Lumberyard was in fact a lumberyard in its past life. View of the courtyard from the second floor. Notice the wood decking all around, that is Ipe, a Brazilian hardwood. Imagine the contractors who worked on this decking as they try to shape each plank around the concrete seat wall. When I finished my course in Landscape Architecture at UCLA Extension in 2007, I designed a similar gathering area for my thesis on Little Tokyo. Guess when the Lumberyard opened? April 2009. That's right, my design was two years ahead of them (wink, wink, I'm tooting my own horn). Thank you very much! There are three cylindrical aquariums scattered in the courtyard. Oh look, it's Dory. Where's Nemo? Hello, that's me and my boy....Michi the Shih Tzu. Crumbs Bake Shop: where I will be getting my cupcake. It's me again. On my right hand is corn on a stick. The corn is topped with cotija cheese, chili powder, and with a wedge of lime on the side. At $4 a stick, I just had to try it. Cafe Habana: A bar and restaurant where I got my corn on a stick. Owned by Cindy Crawford's husband, Rande Gerber, who happen to be Malibu residents. 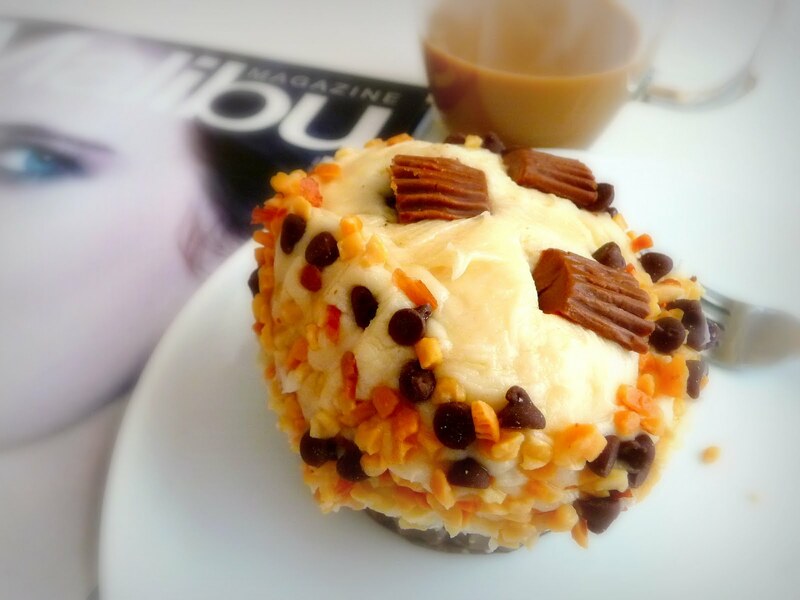 Before heading home, I picked up a free Malibu magazine, and my peanut butter cupcake from Crumbs. The cupcake itself is chocolate. Not too rich in its chocolate flavor, and not too sweet either. I like that it's not too sweet, but I wanted it to be more chocolate-y. It is topped with cream, peanuts, chocolate chips and Resee's peanut butter cups. It's $3.75 a piece --- again, I just had to try it.